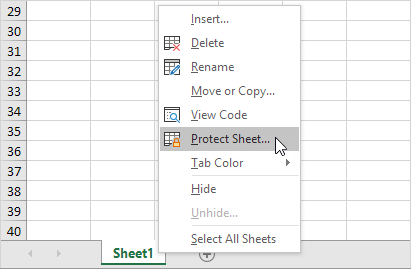 When you share an Excel file with other users, you may want to protect a worksheet to help prevent it from being changed. 1. Right click a worksheet tab. 4. Check the actions you allow the users of your worksheet to perform. Note: if you don't check any action, users can only view the Excel file! 6. Confirm the password and click OK. Your worksheet is protected now. 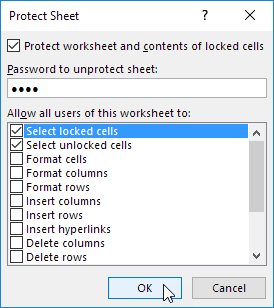 To unprotect a worksheet, right click on the worksheet tab and click Unprotect Sheet. 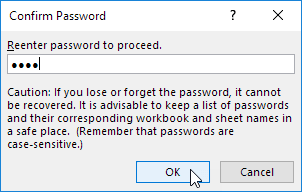 The password for the downloadable Excel file is "easy".